Apple has been granted a new patent by the United States Patent and Trademark Office yesterday. Seemingly, the Apple patent covered the Apple Pencil of the future that would be able to work with the iPhone. As we speak, the Apple Pencil costs $99 and works with the company’s iPad Pro models. This is due to the reason that for the Apple Pencil to work, the display of the device must have a special system underneath. The current iPhone models lack these special systems, making the Apple Pencil ununsable. So let’s dive in to see some more details on the subject. The Apple patent is titles as “Devices and methods for manipulating user interfaces with a stylus”. The patent describes the Apple Pencil which will be able to support a wide range of electronic devices outfitted with a touchscreen as well as with one or more sensors to detect the stylus signals. In some personifications, the patent also describes the use of a stylus with portable devices like the iPhone, iPod and iPad. In this scenario, the stylus will take advantage of the projected mutual capacitance sensing technology that the Cupertino giant’s current OS devices use. The patent text depicts that the future Apple Pencil may work with other types of apps like word processing, game playing, spreadsheet making, image editing, web browsing, email and much more. In addition to this, the patent also mentions that the stylus will also be able to work with the touch sensitive trackpads of devices such as a Mac. The illustrations and references used in the patent clearly mentions the ‘iPhone’ or ‘phone’. Originally the patent was filed in September of 2015 and credits Apple engineers Linda L. Dong, Mark K. Hauenstein, Jeffrey Traer Bernstein and Julian Missig as the people who invented it. Apple Pencil for the iPhone is not something that popped out of the blue. Instead, it has been in the news for quite a while. Last September Tim Cook said that the Apple Pencil could soon work with the iPhone. Could it be possible that the next iPhone might incorporate additional sensors for the Apple Pencil to work? There will be more to the story, so be sure to stay tuned in for more details. This is it for now, folks. 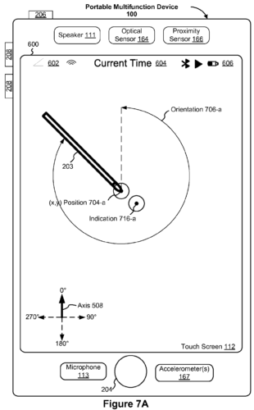 What are your thoughts on the new Apple patent hinting Apple Pencil support for the iPhone? Share your views in the comments.